Rated PG-13 with a running time of 114 minutes. Director Kevin Macdonald (The Last King of Scotland, State of Play) has returned with his latest offering, The Eagle, a historical drama set in Roman-controlled Britannia. Fans of the early second century who have dedicated a considerable portion of their lives to the understanding of the various tribal movements, political situations, and general feelings between the British tribes and the occupying Romans will likely find some entertaining and enlightening moments. To the other 99 percent of us, The Eagle is a predictable and uninspired film that manages to offer some entertainment, despite itself. The Eagle is not a bad film, it just fails to live up to the glimmers of potential that it shows. There are just too many themes that don’t go anywhere, and the movie seems unsure of who it is trying to appeal to. Even the interesting action scenes are heavily edited — possibly to secure the PG-13 rating — so the action fans will only be mildly entertained. There are some historical details that are interesting, but they are quickly glossed over so history buffs will be left wanting. There is a relationship between the two main characters whom begin as enemies and grow to respect each other, but it isn’t handled all that well, so fans of predictable dramas will leave feeling underwhelmed. And that is The Eagle in a nutshell — several interesting parts that do not coalesce into the movie that it wants to be. Now, all of that being said, there are still some moments of enjoyment to be squeezed from The Eagle. The plot is derivative and predictable, but it is not a bad story. The acting varies, but it is solid overall. The cinematography is also fairly strong, and the look of the country (filmed in England, Hungary and the Scottish Highlands) is impressive. While the movie never shines, it never offends either. History buffs with an interest in Roman times or ancient British history will likely enjoy this film — as long as they don’t look too deeply at the details. The Eagle does several things well, but it feels like there is a better story there, just under the surface. In the year 140 AD, a young Roman centurion accepts his first command, and surprisingly asks to be assigned to the northern most part of the Roman Empire, in what would one day become England. It was a savage age, with nary a tea time nor a biscuit to be had, and Hadrian’s Wall marked the boundary of the known world. Beyond it, tribes of people who would one day lend their genetic stock to make up the modern day English and Scottish people resisted the influence of Rome. Uprisings were common, and 20 years earlier the entire 5,000-man Ninth Legion disappeared, along with its Roman Imperial Eagle, thus bringing shame to all of Rome. 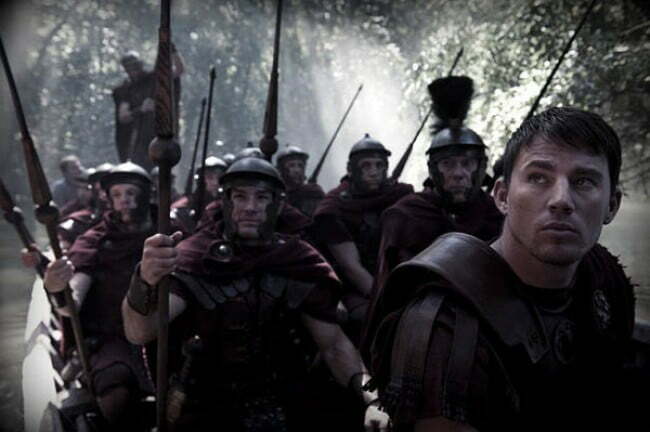 The Roman Eagle was considered a piece of Rome itself, and the dishonor of losing it reverberated through the Ninth Legion commander’s family, leaving a stain on the reputation of his son, the new commander, Marcus Aquila (Channing Tatum). Following his posting, Aquila quickly earns the respect of his men in battle, but suffers a terrible wound in the process, resulting in his honorable discharge. While recovering at the home of his Uncle Aquila (Donald Sutherland), he witnesses a fight in the arena between a gladiator and a British slave named Esca (Jamie Bell), who’s honor and courage impress Aquila so much that he intercedes on the slave’s behalf to save his life. Esca then becomes Aquila’s personal slave, and swears to repay the Roman for his life, even though he hates him on principle. As Aquila recovers from his wounds, he hears rumors of the missing Eagle in the possession of a Northern tribe. 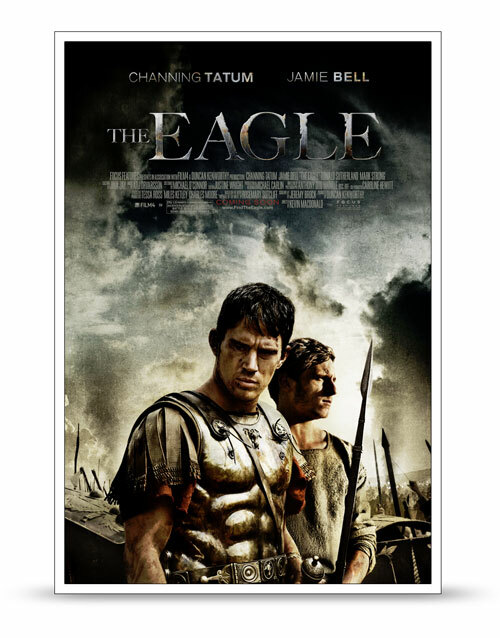 He takes the reluctant Esca as a guide, and sets out north of Hadrian’s Wall to discover what happened to his father, retake the Eagle, and regain honor for his family. Based on the 1954 novel, The Eagle of the Ninth by Rosemary Sutcliff, The Eagle is at its heart the story of Esca and Aquila. The plot of the Imperial Eagle itself is the motivating factor for the movie to progress, but the focus quickly becomes more about the two men, each from a different culture with reason to distrust the other, and how they learn to work together. The details are slightly different, but it is a story that you have seen many times before, in many different settings where war and hatred drove two groups apart. One of the most striking things audiences will notice about The Eagle is that the majority of the Romans speak with an American accent. There has been an unwritten rule that when acting out an adaptation of Ancient Roman life, the cast must speak with a British accent, whether the actors be Americans, Australians, etc. So to hear the actors portray Romans with American accents is deliberate, and it stands out. It is a piece of modern day symbolism, and it is expanded upon through the relationship between Aquila and Esca, who represent modern day America and many of the countries that America now has a military presence in. It is an interesting parallel, but one that never really goes anywhere thanks to the action-oriented ending. If anything, the movie accidentally comes down in favor of America’s expansion, if the symbolism is meant to be an ongoing theme throughout the movie.